The area of "Market Processes" encompasses the development, establishment and implementation of processes and formats for standardised electronic exchange of large data volumes as necessary for compliance with legal and regulatory requirements. With standardised market processes, large data volumes can be efficiently exchanged between the market partners involved. From very early on, TenneT recognised how important market process development is and will continue to be for the energy market as a whole. In its function as a transmission system operator, TenneT not only plays the role of a classic TSO; it also implements the standardised processes of a distribution system operator, meter point operator, supplier and balancing group manager. For this reason, a separate "Market Processes" organisational unit was established in 2011 to allow for the bundling of the associated broad range of topics into a single area. In this regard, it is especially important to TenneT to focus not only on implementation of the requirements established largely by legislative and regulatory bodies but also to actively participate in shaping the processes. To make this possible, TenneT has participated since 2000 in the pertinent bodies of the national associations as well as in the Bundesverband der Energie- und Wasserwirtschaft e.V. (BDEW, German Association of Energy and Water Industries) and the organisation that authors technical rules for power grids in Germany (FNN). This work takes place in close and continuous contact with the competent authorities (including the Federal Network Agency) and ministries. 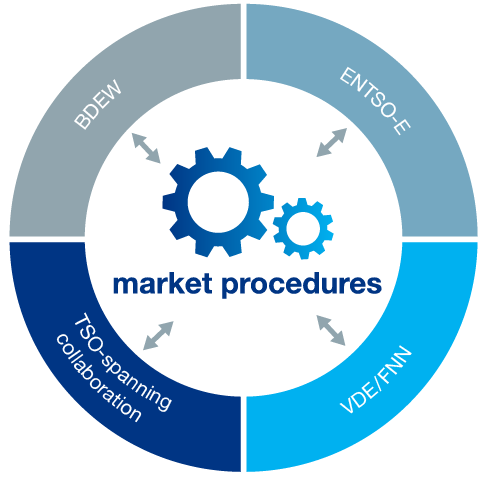 Through regular exchanges with the transmission system operators at the national and international levels, including within the organisation "European Network of Transmission System Operators for Electricity" (ENSTO-E), TenneT can also bring these high-level insights into the development of market processes. The rules for secure exchange of EDIFACT transmission files can be found in the currently valid version at www.edi-energy.de under “Regelungen zum Übertragungsweg” [Provisions on transmission routes]. The role model was developed with the goal of simplifying communication between the market partners in the energy industry within the framework of electronic data exchange. To this end, roles were defined along with corresponding responsibilities, regions and objects as the basis for the process development.